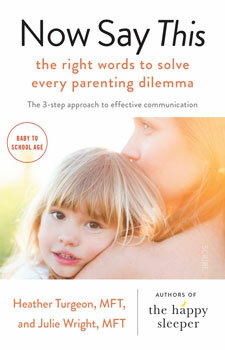 A powerful new book that gives flustered parents the exact words to use in any situation. A toddler meltdown over the wrong pair of pants, siblings fighting in the back of the car, constant struggles just to leave the house … Parents have the best intentions to be patient and loving, but in the heat of the moment they often find themselves feeling helpless, desperate, and so frustrated that they resort to yelling, threatening, bribing, or caving. Now Say This solves the dilemma of how to be empathic and effective at once. Best of all, it answers the question Now, what do you actually say? using scripts and body-language tips from reallife examples. User-friendly and research based, Now Say This transforms remarkable ideas into practical how-tos that busy parents can use right away. Julie Wright, MFT, is one of Los Angeles' best-known parenting group leaders, and has taught thousands of moms in her popular Wright Mommy and Me groups at the celebrated Pump Station & Nurtury. Julie is a psychotherapist whose work focuses on empathic, mindful parenting; attachment; and sleep. She has specialised training and experience in the 0-to-3 years, interning at Cedars Sinai Early Childhood Center and LA Child Guidance Clinic. Julie lives in Los Angeles with her son, and visits her East Coast family often.